It hurts. I admit it. Over the years that I’ve been writing and submitting my stories for publication, I’ve received hundreds if not thousands of rejection letters and emails, and I’m still not immune to the sting of rejection. I have enough rejections to line the walls of my dining room. Stuff like, “not for us,” “thanks for submitting, but we’ve decided….” or the worst one: “not funny and not fair.” Yikes! It’s hard enough to put yourself and your work ‘out there.’ Still, rejection comes with the territory. 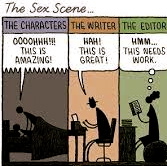 And of course, one can always rewrite (or not) and re-submit someplace else, move the story to an archive file, join a writing group, or simply rationalize: They wouldn’t know a good story if it hit them in the arse. In my heart of hearts, I’ve never quite believed that once your writing has reached a certain level of competence, it’s a matter of taste. Still, this is what other (more accomplished) writers have been telling me. When 13 Rules won, I was so bowled over I forgot to notify Fiction Attic and withdraw it from their consideration. Bet you can guess what happened next…. A few weeks after I won the NMW fiction contest, Fiction Attic emailed me to say it wanted to publish two of the three flash fictions I submitted – and the one they didn’t want was – ta da! – 13 Rules. 1) One man’s meat is another man’s poison. 2) After a certain level of competence, it really is just a matter of taste. p.s. Coward that I am, I never did tell Fiction Attic the story they rejected just won 1st prize somewhere else. This entry was posted in Blog Post SJ Powers, Creative non-fiction, Humor, Irony, Literary Fiction, Literary Writing, Short Short Story, Writer, Writer's Blog and tagged 13 Rules, My Award-Winning Story, New Millennium Writings, Rejection. Bookmark the permalink. Thanks Ali, appreciate your encouragement. Keeping my fingers crossed I can find some one – besides myself – to publish my book of stories. Had a friend win a fiction contest and next thing an agent was there asking if he had a novel, which so happens he did. Sigh…..
“13 Rules” is incredible! On many levels. No wonder it WON!! Congrats!!!!!!!!!!!!!!!!!!!!! I thought that 13 Rules was the most original and powerful piece I had read in, well in a long, long time. So I sent it to a friend, who responded with “I didn’t get it>” Yes, it’s all a matter of taste.